I do a little sculpturing and painting. Dabbling. I’m not a professional, I’m a retired old man. I actually trained as an economist in Germany prior to my arrival here in New York. The year Marilyn Monroe died . And it was strictly adventurous, not a typical immigrant story. I liked New York—it was a fun place in the sixties and seventies. The city really embraced my lifestyle. What kind of lifestyle is that? I’ve lived a will-o’-the-wisp life. There was a lot of international travel, and then I did all sorts of things in between just to finance my travels. I worked for a German corporation, for a restaurant, as an executive assistant—whatever came up. You name it. I went to Rio a couple of times, Thailand numerous times, and to India, of course, but that was just to see the Taj Mahal. And to Egypt to see the pyramids, and Iraq in 1968 because I wanted to see the Hanging Gardens. Have you seen all the Seven Wonders? Yes. And it was when I saw the ticker-tape parades in New York on TV that I wanted to come here. I live in a very historic building called the Ansonia on the Upper West Side. I have lived there since 1977, to be exact, and now I couldn’t afford it. I still remain rental, even though it’s gone condo. Is your rent in the three figures? Of course! I don’t pay $90 a month! I meant, is it under a thousand? This is my least favorite coat. 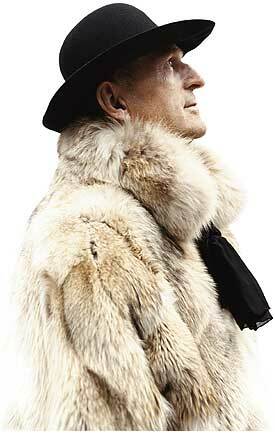 I have fifteen fur coats, and I wish I’d met you on one of my other strolls up and down Madison Avenue. There are so many others that are more exciting or eye-catching. But I bought this one at Alexander Ross on East 59th Street, which no longer exists. And it’s just a little black silk scarf and a black Eric Javits hat from Saks. I don’t want to blow my own horn, but do you know Quentin Crisp? The Naked Civil Servant? You see yourself as a German Quentin Crisp?